Less than a year after the launch of the first Majesty 135, Gulf Craft announces that the second hull of this semi-custom series has hit the water. This second Majesty 135 was sold to a GCC owner in April 2012. She's easily distinguishable from her sister thanks to a completely white paint job. 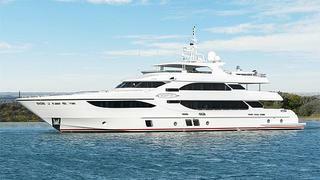 As reminder, the Majesty 135 is a composite series with a length of 41.05m. The naval architecture and exterior styling are by the in-house team at Gulf Craft. In this case, the interior was customised to accommodate 12 guests in a full-beam master suite on the upper deck, a special VIP suite on the main deck and four double cabins on the lower deck. Powered by twin MTU 12V 4000M94 engines, the Majesty 135 reaches a maximum speed of 25 knots and has a range of 1,100 nautical miles at her cruising speed. 'We have just completed a successful sea trial of the new Majesty 135 and it’s a testimony to the buoyancy of the region’s market that the superyacht will be spending much of its time in GCC waters' commented Erwin Bamps, COO of Gulf Craft. The second Majesty 135 is scheduled to make her debut at the upcoming Dubai Boat Show in March. And a third hull is already under construction.